He’s not someone who matters much outside the piano world – if you’re a violinist, you’ll probably never learn Clementi – but he’s hugely important as a piano player, especially at a grade 3 level. In today’s episode, we’re going to discuss the life and times of Muzio Clementi, his musical style, and why he matters. Let’s get started! First of all – basic details. Clementi was born in 1752 (two years after Bach’s death), and lived until 1832 to the respectable age of 80. He was originally born in Rome, Italy, but spent the majority of his life in England, particularly London. Muzio Clementi’s father, Nicolo, noticed Clementi’s musical talent at an early age. They had a relative who was the music director at St. Peter’s Basilica, so Nicolo asked him to give Muzio some keyboard lessons to help develop this talent. By the time Clementi was 7, he began more formal instruction. He learned how to sing, and studied figured bass, which in modern days would be akin to learning how to improvise chords on the piano. Figured bass was the Baroque style – looking at what were essentially chord symbols and improvising the background part. By the time he was 11, he was learning counterpoint, another Baroque staple – basically when there are more than one melody (tune) played at the same time, usually 3 or 4. When Clementi was 13, he had already composed an oratorio and a mass, which are huge-scale vocal and instrumental works. So to sum up – child genius. Since people started careers very young back in the day, Clementi became the organist at a Rome Church, San Lorenzo in Damaso. He was 14 years old at the time, and the year was 1766. He didn’t keep that job for long, though, since he was swooped away to England. In 1766, a man named Sir Peter Beckford traveled to Rome and happened upon Clementi. He noted that Clementi was very talented, and decided he wanted to bring Clementi back with him to England. 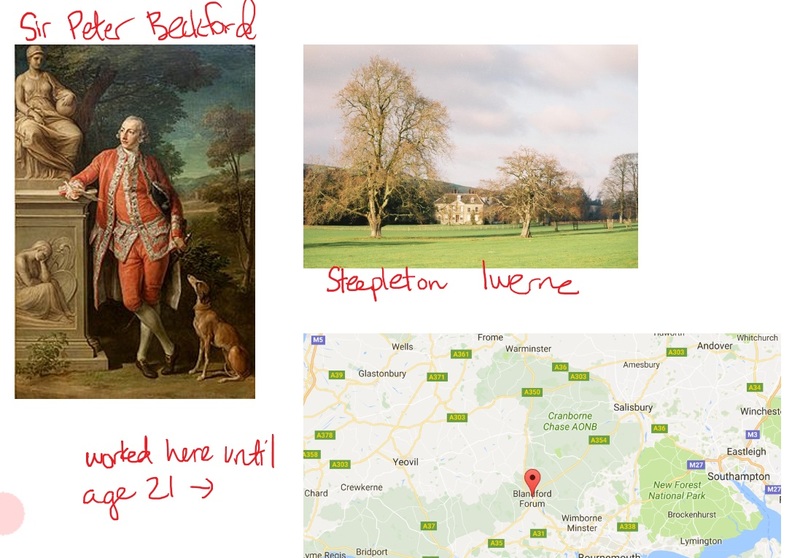 Beckford was quite wealthy, and so he offered to Nicolo, Clementi’s father, a deal – Clementi go to England to serve as musical entertainment at his estate at Steepleton Iwerne, north of Blandford Forum in Dorset, England. In exchange, he would give quarterly payments to sponsor Clementi’s education until he reached age 21. Clementi’s father, and I suppose Clementi himself, were game. He worked for Beckford for 7 years, until the agreed-upon age of 21. During this time, Clementi apparently spent 8 hours a day at the harpsichord, practicing composers like JS Bach and CPE Bach, Handel, Scarlatti, and other Baroque staples. Once he was freed from his musical obligations to Beckford, Clementi moved to London in 1774, making public appearances as a harpsichordist and conductor. By the end of the 1770’s, he was quite well-known. In 1780, Clementi went on tour to other European cities, such as Paris and Vienna. In Paris he was very well-received, even performing for Marie Antoinette. But it was in Vienna where he had an infamous duel with Mozart. Not a fist-fight duel, but a musical duel. They were at a party of the Viennese emperor, Joseph II, and he decided it would be fun to pit Clementi and Mozart against each other. They were each required to improvise and perform selections of their own writing. Mozart would have been about 24, and Clementi 28. I assume awesomeness ensued, and the emperor declared both of their skills very great, and drew a tie. On the other hand, Clementi had nothing but positive enthusiasm for Mozart. He must’ve admired Mozart’s music, as he made many transcriptions of it. More on the subject of Clementi and Mozart, Clementi wrote his sonata in B flat major, op. 24, no. 2, in 1770, which Mozart borrowed in the overture to his opera The Magic Flute in 1780. In this day and age that would slap Mozart with a lawsuit because of copyright infringement, but back then, musicians borrowed from each other all the time and it was considered a compliment. Still, Clementi felt the need to note in his sonata publication that the original idea was, in fact, his – not Mozart’s. By 1783, Clementi was back in England, where he would remain for the next 20 years. He was 31, and established himself as a great piano player, conductor and teacher. There are some really interesting teacher-student lineages worth mentioning here. 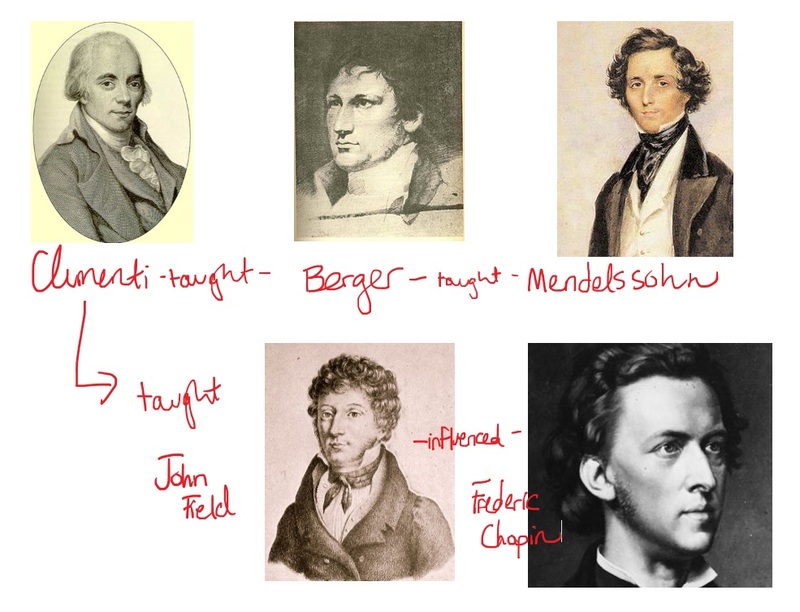 One of Clementi’s students was Ludwig Berger, who went on to teach the famous Felix Mendelssohn. He also taught John Field, who would end up being a big influence on Frederic Chopin. By the end of the 1780s, Clementi was known for his flamboyant, virtuosic style – he performed lots of impressive improv and wildly difficult playing. Later in life he restrained himself a little and developed that refined cantabile style he’s known for today. 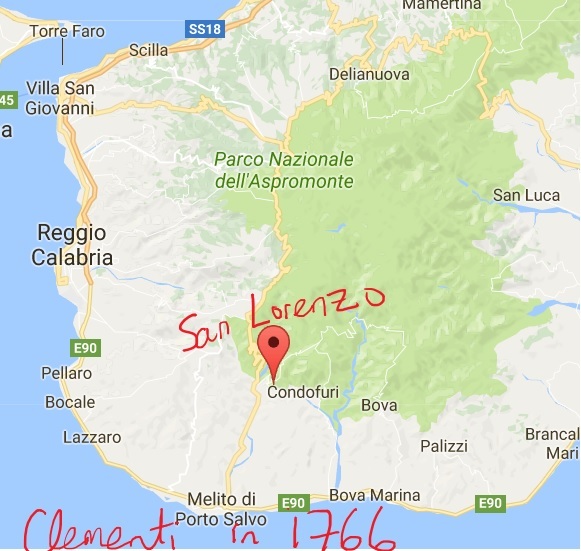 So now we’re going to jump ahead to 1798 – Clementi was 45, and entered the business world. He ended up taking over a publishing firm on a very prestigious shopping street in London (26 Cheapside). He also opened up other offices for music publication, and even began manufacturing pianos. Now this is where we bring in Beethoven. Mozart was pretty critical to Clementi (not to his face, but in private letters to people), but Beethoven was the opposite – he had nothing but nice things to say about the guy. For starters, Beethoven allowed Clementi full publishing rights to his music in England, which was no small thing. Clementi was (and is) known for his sonatas and sonatinas. Beethoven would often play Clementi sonatas, and passionately recommended them to many people, including his nephew Karl. Carl Czerny, who was a student of Beethoven’s, also loved Clementi piano sonatas – which makes sense, seeing as he was generally enthusiastic about Beethoven, and Beethoven would have taught the sonatas to him. Czerny then went on to teach the sonatas to Franz Liszt. Isn’t musical teaching lineage fun? By 1810, when Clementi was 58, he stopped performing so he could focus on writing music and building pianos. He founded what is now the Royal Philharmonic Society, a group that used to feature performances by famous players, and nowadays promotes programs for young musicians. He was doing well for himself. His piano making business flourished, and Clementi was a frontrunner in innovating the piano we know and love today. See, harpsichords were the main keyboard instrument up until the end of the 1700s, when the piano was created and started gaining popularity. Clementi was at the front of that wave, using both his skills as a piano player and an inventor/mechanic. Never one to settle into a simple life, Clementi decided to make a few trips to Paris, Frankfurt, Munich and Leipzig between 1816 and 1821. During this trip, he featured his new compositions and conducted his symphonies. He went on another journey in 1826-27 to publish his ultimate collection of keyboard studies named Gradus ad Parnassum (steps to the highest part of a mountain range in Greece, Parnassus). In 1828, he made his final public appearance at the opening concert of the Philharmonic Society, which he officially retired from in 1830, when he was 78 years old. After that, he officially retired to Evesham, Worcestershire, and died 2 years later at the age of 80 in 1832. He died after a short illness. Basically, Clementi lived and died the dream – he worked hard, probably had an interesting life (though since it was so long ago, there’s much we don’t know), and died quickly at an old age without major health issues. Clementi is buried at Westminster Abbey, along with others such as John Field. Let’s spend a minute talking about Clementi’s music. He composed almost 110 piano sonatas. His op. 36 sonatinas are standard intermediate piano repertoire – they sound good, make for great finger exercises, and are challenging to play but easy to understand. However, most of Clementi’s sonatas are very difficult – more difficult than Mozart’s. 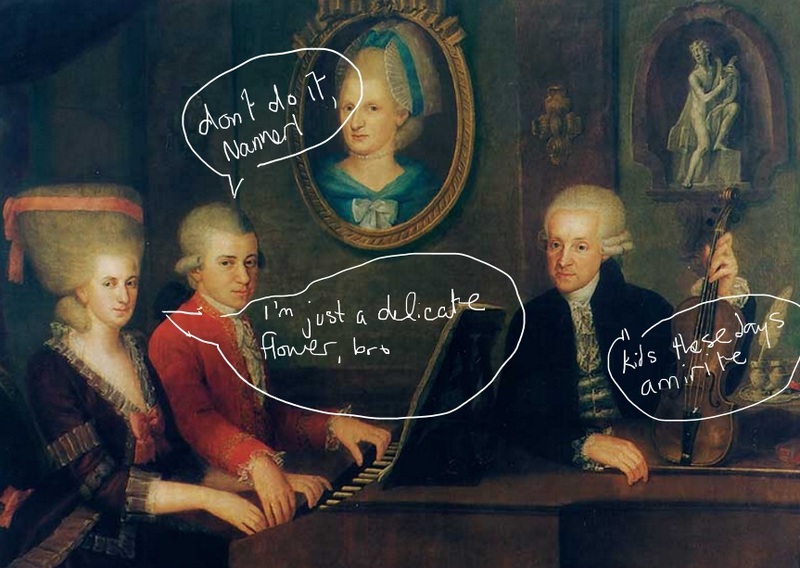 Mozart even told his sister, Nannerl, that she shouldn’t play Clementi’s sonatas, since they had huge leaps and might ruin the natural lightness of her hands. He also composed around 20 symphonies, but those aren’t well-known, most being lost to time. Clementi is, nowadays, known for his piano music. Clementi music isn’t the kind you can expect to see performed in concert halls, either. Clementi’s music largely serves a functional, educational purpose. However, there is no shortage of Clementi recordings out there. Aside from Beethoven and Czerny being huge fans of Clementi, Chopin also had his students practice Clementi preludes and exercises. If it’s good enough for Chopin, it’s good enough for me! In our famous music performer video we talked about Vladimir Horowitz. He’s also very fond of Clementi. His wife once gifted the complete works of Clementi, and he enjoyed them so much he was inspired to record Clementi sonatas. Despite his fame and success in his day, and the enthusiasm other composers like Beethoven had toward him, Clementi was destined to lesser fame than his counterparts, like Haydn and Mozart. Even though history doesn’t put him in the same degree of spotlight, he was still a critical element to the development of Classical piano style, and the development of the piano itself. He’s nicknamed the “Father of the Piano” for a reason, after all. So when we, as piano players, are interpreting Clementi, those are three key points we must always keep in mind. Ultimately, my final word on Clementi is this: He was the original piano man. He performed on it, wrote for it (in all levels from beginner to advanced), published piano music, and even built and manufactured them. If that doesn’t make him the original piano man, I don’t know what does. If you enjoyed this history video, I recommend you check out some of the other history videos on this channel, such as the History of Mozart and the History of Beethoven. Also consider supporting us on Patreon if you enjoy the content.